To view original article by Lindsay Rafayko please click here. 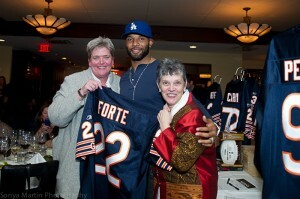 On the evening of Monday , October 17th, Morton’s The Steakhouse in Northbrook was alive with energy and excitement as the Chicago Bears prepared for their 2nd Celebrity Servers Dinner featuring the unbelievably outgoing Cornerback, Charles Tillman. Chicago Bears players and their families, Morton’s VIPs, media, and steak lovers alike gathered to enjoy an evening of fine dining and fun in support of Charles Tillman’s Cornerstone Foundation, an organization that provides opportunities and resources to over one million Chicagoland children and families in need. 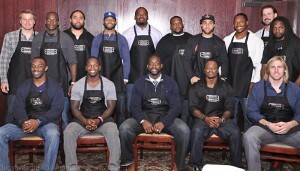 Charles Tillman and his Celebrity Servers. Go Bears! Tillman and teammates, including Anthony Adams, Lance Briggs, Matt Forte, Frank Omiyale, Patrick Manelly, Matt Toeaina, Caleb Hanie, Johnny Knox, Zackary Bowman, Corey Graham, Tim Jennings, D.J. Moore, Brandon Meriweather and Craig Steltz, traded in their signature orange and blue for Morton’s aprons as they passed wine and hors d’oeuvres and signed footballs for guests during the cocktail hour. The dinner began with a few words from host Zach Zaidman, Sideline Reporter for the Chicago Bears Radio Network, Tom Lange, the General Manager of Morton’s in Northbrook, and Tillman, who introduced fellow teammates and explained his organization, the Charles Tillman Cornerstone Foundation. He shared the story of his young three-year old daughter Tiana, who at three months old was diagnosed with dilated cardiomyopathy, a heart disease that slows the pumping of blood to the body. Now a vibrant toddler, Tiana survived with a heart transplant, and Tillman continues to tell her story to educate and inspire. Smiling players juggled plates of salad and juicy prime steak to serve hungry guests, some even going as far as bussing the tables themselves! A silent auction setup included signed jerseys and memorabilia, trips, and other luxury items, while the rousing live auction included Tillman gear, signed photographs, a massive bottle of wine, and a one-of-a-kind golf trip, among others. Tillman captivated the crowd with his stories and jokes throughout the evening, especially during the auction as he ran across the restaurant from bidder to bidder, hugging them, taking photos, and encouraging everyone to give more. 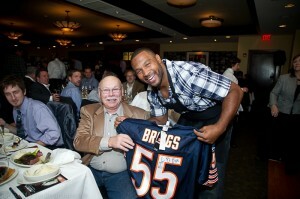 Tillman’s enthusiasm and incredible dedication to his cause paid off, as the dinner raised nearly $150,000 in total. Since 2005, Tillman’s charitable efforts have impacted the lives of over one million Chicago-area children. The Celebrity Servers Dinner with Charles Tillman was an incredible evening for a cause we can all stand behind – we hope you’ll join us next time!